Mr Assange had argued that the conditions violated his "fundamental rights and freedoms", and were intended to force him to leave. 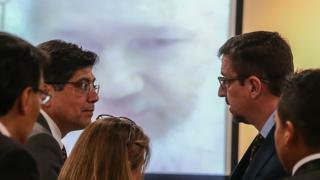 WikiLeaks lawyer Baltasar Garzón launched the legal action in Ecuador earlier this month and Mr Assange addressed the hearing in the capital, Quito, on Monday via teleconference. Ecuador's Attorney General Iñigo Salvador said that if Mr Assange wanted to stay "and he follows the rules... he can stay at the embassy as long as he wants". He added that his time at the embassy had so far cost Ecuador $6m (£4.6m). Judge Karina Martínez ruled against Mr Assange, saying that the foreign ministry was in charge of determining his living conditions. Mr Assange's legal team launched an appeal which will be heard by a higher court in the coming days. In March, the embassy in London removed Mr Assange's internet connection, accusing him of "interfering in other countries' affairs".